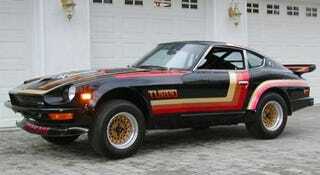 1980s New Jersey Time Capsule: 19K-Mile Datsun 240Z Could Be Yours! Like a time warp straight out of the 70s, with every optimistic Malaise-denying piece on there. Every angle induces another "Oh my God" reaction, every feature seems like some unholy caricature of a kitsch utopia. Makes "Black Gold" look restrained and tasteful by comparison, and pretty much every other 70s special edition seem subdued as a result. If you're featuring this car on Jalopnik (and I sincerely hope you do, it's too good to pass up), it would be a crime against humanity not to feature the skewed front bumper with "AWESOME" scrawled across the front (the only way it would be cooler is if it was backwards, like the TURBO markings on a BMW 2002) and the He-Man-inspired fantasy art on the hood scoop. Clearly the owner had a massive polyester-panted hard-on for shaggin-wagons as well as the beauty and majesty of the upcoming 1980s, a better time improved by TECHNOLOGY! Is it any surprise this car is from Jersey? Oh, and it's got no engine. Natch.